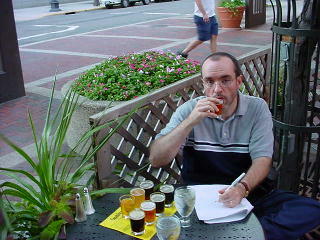 Brewtopia Events and the Classic City Brew Fest are operated by Owen Ogletree of Athens, GA. Owen is a certified beer judge, beer author, beer traveler, award-winning homebrewer, and a founding member of "Georgians for World Class Beer." On the Labor Day weekend of 2001 Owen and Kerri visited several beer bars and brewpubs in Minneapolis and Saint Paul, Minnesota. Below are some pictures and brief notes regarding some of the most memorable spots visited. This list is not comprehensive, and since pubs come and go rather quickly, be sure to call ahead before you visit. Have you experienced any of these establishments? Owen always welcomes your e-mail and feedback. Impressions: This is my favorite brewpub in the area. It is an attractive place with an upscale, yet casual atmosphere. There is an area near the brew room with couches and pool. Brewer Michael Hoops previously brewed at Fitger's Brewhouse in Duluth, MN, and his beers at Town Hall are absolutely wonderful. Food: Walleye sandwich, meatloaf sandwich, burgers, buffalo chicken penne pasta, steaks and chops. Beer: Bright Spot Golden Ale (clean and light), West Bank Bitter (British ale with low alcohol and nice hop component), Masala Mama IPA (what a superb IPA - intense hops! ), Hope and King Scottish Ale (nutty, malty, pleasant), Black Water Oatmeal Stout (roasty with licorice hints), Oktoberfest (caramel flavors, toasty, malty, smooth), Pumpkin Ale (lots of pumpkin and spice - well balanced), Smoked Porter (this cask ale was well balanced with a bit of smoke and chocolate malt flavors). 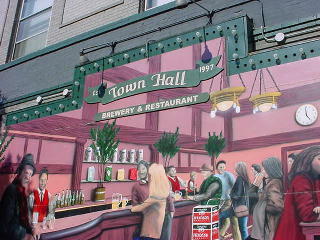 Town Hall has won many medals for their beers including a GABF bronze for their Stout. You must try these beers. Impressions: This BOP (brew on premises) has a number of small kettles and fermenters where interested patrons can pick a recipe and produce their own small batch of beer. This is possibly the oldest BOP in the states. Pretty cool. Food: Sandwiches, brie and green apple pasta, pork chops, and other pub fare. Beer: All their beers are served at good cellar temperatures (50 degrees F). St. Peter Pale Ale (copper with good bittering hops), Golden Prairie Blond (grain/wheat-like flavors), Brown Trout Brown Ale (roasty and dry with notes of coffee), Pot Hole Porter (based on a 19th century recipe - English-style with a nice, burnt/roast/chocolate flavor - very interesting), Martin's Bitter (Yorkshire styled bitter with nice hop aroma - very floral), Norma Stout (English Stout with a mild flavor - made with oatmeal). Be sure to try any of their regular and seasonal cask ales . Impressions: Gemutlichkeit is a huge, two-story German restaurant and beer hall. 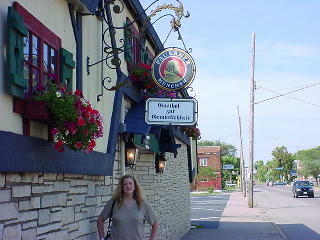 The top picture shows Kerri under their authentic Paulaner sign out front. The bottom picture was taken in one of their three large food halls upstairs. 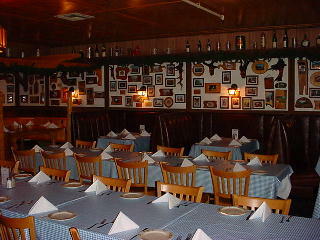 Mario's bar (downstairs) is a wonderful German beer hall complete with large tables and liter mugs. German music blasts over the loud speakers when there is not live music, and the entire place drips with authentic Bavarian atmosphere. What a fun place to spend a few hours! It is open for lunch and dinner on Tuesday through Saturday, opens at 3 pm on Sunday, and closed on Monday. Food: Hearty German fare like schnitzel, fish, chicken, and bratwurst. The dumplings, potato cakes, and breads are good choices for vegetarians. Beer: Hacker-Pschorr, Paulaner, and Spaten lagers and wheat beers highlight the beer list. Hofbrauhaus lagers and Oktoberfest are also included. The best beer in the place is the high alcohol Salvator Dopplebock from Paulaner (don't try to drink a liter of this unless you want this to be your only beer of the night). Impressions: This pub has a first floor (pub) and a basement (peanut bar). The two floors are connected by a large interior stairwell for easy passage from one level to the other. Upstairs in the pub they offer a minimum of 300 different bottled beers daily, and they update and republish the bottled beer list in the bar every Friday. Downstairs in the Peanut Bar you'll find a minimum of 70 different draft beers daily, and they also update and republish the draft beer list each Friday. William's is about one block away from the popular Calhoun Square shopping area and features video trivia, pool, and darts. They are open 365 days a year -- including Christmas! Beer: Your best bet here would be to try a fresh, local, microbrewed beer or one of the ales or lagers that would have a high alcohol content. These Belgian Ales, Imperial Stouts, and Double Bocks have high alcohol, but their real selling point is their rich, intense flavor. Impressions: What a place! 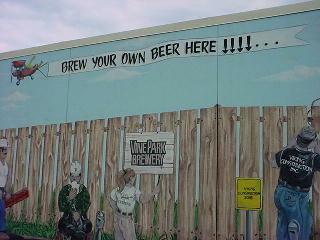 This brewpub with English cask ales is about a 20 minute drive outside of Minneapolis in a shopping area in Minnetonka. Call for directions -- it is worth the trip! The place is beautiful with high ceilings and a nice marble bar. There are large dining areas and the brewroom is in the back. 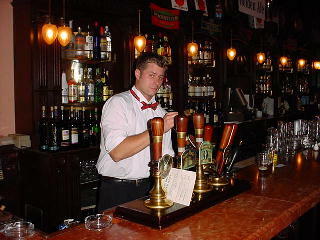 Beer expert Michael Jackson has visited Sherlock's on occasion and will be hosting a special beer event there late in 2001. Food: English fare with salads, sandwiches, burgers, and a special "Taste of Britain" section of the menu with Cornish beef pasty, stoved chicken, ploughman's lunch, bangers and mash, kidney pie, and Scottish salmon filet. Beer: Queen Anne Light (clean and light), Gold Crown Lager (pale malt and god hops - a flavorful light beer), Star of India IPA (light in flavor and hops), Bishop's Bitter (English real ale with a nice body), Piper's Pride Scottish Ale (dark copper color and malty with a peat-like aftertaste that is rich and earthy), Palace Porter (chocolate malt that is dry and a bit tart with a smoky aroma), Stag's Head Stout (roasty aroma with a dry, dark malt flavor - very smooth and delicious). Seasonals are also on tap on a regular basis. Many of their beers are served on cask and will show flavor changes from oxidation over the 2-3 days it may take to empty a cask. Try the full sampler to see what is most fresh and suits your taste on the day you visit. Old Chicago Beer Pubs, several locations in the area. 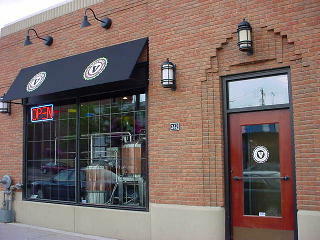 Herkimer Pub and Brewery, 2922 Lyndale, Minneapolis, MN, 612-821-0101. Spartan brewpub with only two beers on draft when we visited. Call ahead. 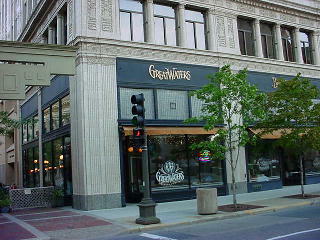 Green Mill Brewing, 57 Hamline Ave. South, St. Paul, MN, 651-698-0353. The beers are very mild and watery, but the food is great. Rock Bottom Brewery, 825 Hennepin Ave., Minneapolis, MN, 612-332-2739. Part of the good Rock Bottom/Big River chain that is nationwide. Stub and Herb's Bar, 227 Oak St. SE, Minneapolis, MN (near the University), 612-379-1880. 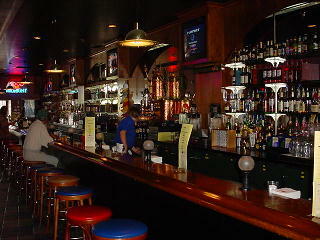 Sweeney's Bar, 96 Dale St. N., St. Paul, MN, 651-221-9157.